National Parks, long the crown jewels of our country’s natural wonders, have enjoyed a surge in popularity in recent years, resulting in long lines, scarce parking, and a generally degraded user experience. 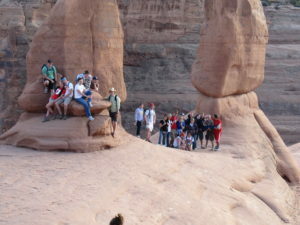 Arches National Park, in particular, has seen visitation growth of over 90 percent in the last decade. Recently, the National Park Service proposed a seasonal “timed entry” reservation system, which would spread entry into the park over the course of a day, with entries limited to certain three-hour windows between 7 a.m. and 6 p.m.
“We would get more visitors in and they would have a better experience where they didn‘t have to fight to drive in and fight to find a place to park,” said park Superintendent Kate Cannon. The proposed plan would enable Arches to handle up to 40 percent more than the 1.6 million visitors it received in 2016, Cannon also said. Under the new proposal, visitors would register at the recreation.gov website; a reservation will cost $1.37, and will not be needed to enter the park prior to 7 a.m. or after 6 p.m.
Other parks have long dealt with severe overcrowding as well, including Zion National Park, where a bus system has been in place for nearly 20 years. Mandatory reservations have been in place for many years in places that the Park Service requires ranger-led tours, such as the Washington Monument. With the technological advances of today, and the ever-growing outdoor recreation economy, implementing some form of reservation system for crowded parks like Arches seems like the logical next step. While the change may require some tweaks, in the end, the user experience will be highly elevated by regulating the flow of visitors into the park. Currently, the Park Service is reviewing comments submitted during the public comment period, which ran through Dec. 4, 2017. Read the Environmental Assessment for the proposal here. You can read case studies about planning for recreation tourism here.